Sugar itself is not dangerous to eat while pregnant. The problem is that many foods that contain high amounts of refined sugar, such as candy, cakes, cookies and soft drinks, don't provide much nutritional benefit. If you're eating these products instead of healthy items, such as fruits, vegetables and whole grains, you're depriving your baby of the nutrients she needs to develop. Unless your doctor specifies otherwise, you should follow a typical healthy diet that includes all the vitamins and nutrients your baby needs to grow. The American Pregnancy Association recommends that all pregnant women talk to their health care provider about their specific nutrient needs. Typically, a balanced diet that includes all the major food groups will provide sufficient nutrition for you and your baby. Note that in your second and third trimester you should eat 300 more calories a day than you would normally to meet the increasing needs of your developing baby. Your diet can include sugar, so long as you don't eat excessive amounts. What counts as excessive will depend on your particular medical condition, but the safest approach is to limit sugary foods as much as possible in favor of healthier items. If you experience nausea, heartburn or constipation, you're in good company. Many pregnant women experience these problems, even if they live a healthy lifestyle and eat right. But you might be able to reduce these negative symptoms by avoiding excess sugar, as well as by drinking plenty of water, exercising regularly and reducing your fat intake, according to the American Pregnancy Association. Gestational diabetes affects 1 to 3 percent of all pregnant women, according to FamilyDoctor.org, but it usually disappears after the baby is born. If you have gestational diabetes, your body has trouble using the glucose in your blood for energy, so your blood sugar levels elevate. This can affect your health by making your delivery more difficult, to the point where you may need a cesarean section. Also, you're at increased risk of developing preclampsia, which causes high blood pressure, swelling that doesn't go away and elevated amounts of protein in your urine. The condition is dangerous if left untreated. Gestational diabetes also affects your baby's health by increasing the risk of problems at birth. For instance, your baby might have jaundice, a low blood sugar level or an abnormally high birth weight. 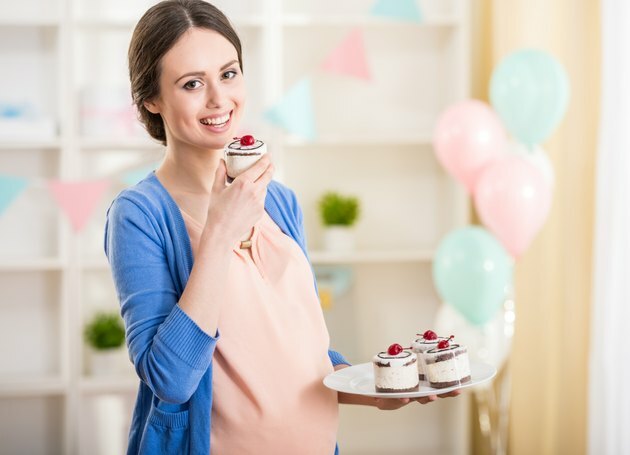 The cause of gestational diabetes is not known, but if you are diagnosed with the condition, your doctor likely will ask you to avoid foods that contain high amounts of simple sugar, such as cookies, cake, candy and ice cream.